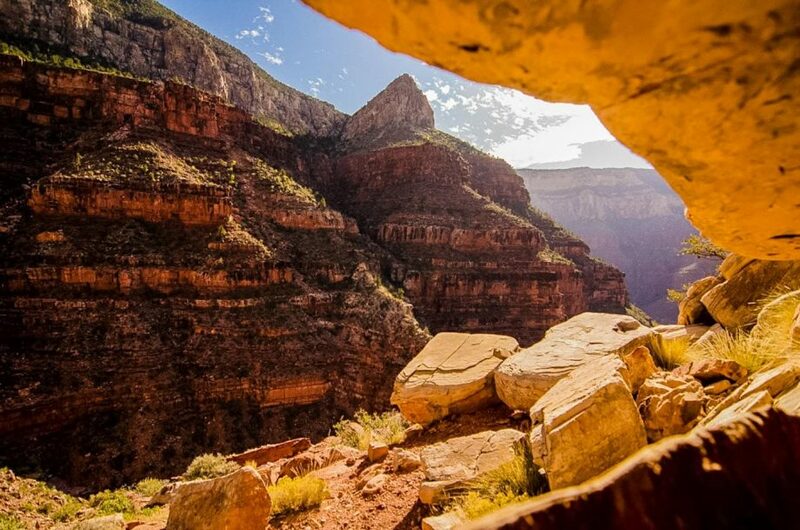 Venture beyond the rim on this Grand Canyon backpacking trip and see the canyon from a unique perspective, the beauty of the abyss resonating differently and personally for each viewer. 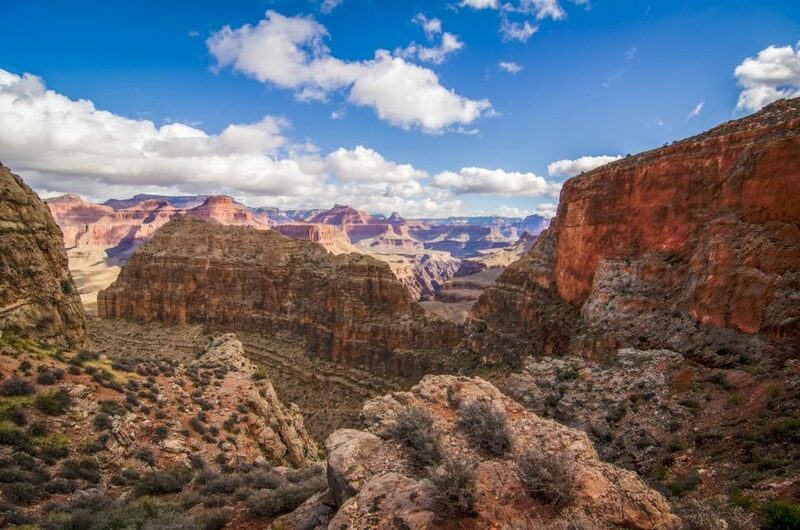 Grand Canyon’s backcountry is a richly diverse wilderness, a rugged and complex environment; this guided Grand Canyon backpacking and camping trip on the Hermit Trail explores a part of the canyon accessible only to a lucky few. 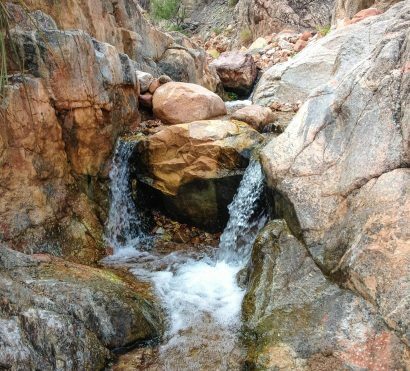 The campground at Hermit Creek sits beside one of the rare perennial waterways within the Grand Canyon, located 3,800 ft below the trailhead and South Rim. The hike in is long, but is punctuated by some of the most dramatic views that can be seen from any trail. Important! 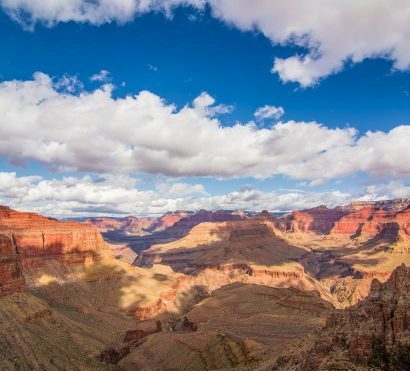 Due to Grand Canyon’s permit system, reservations made 5 months or more in advance have the best chance of securing the dates and itinerary you want. We offer a 5% discount to guests who register 5 months or more in advance. 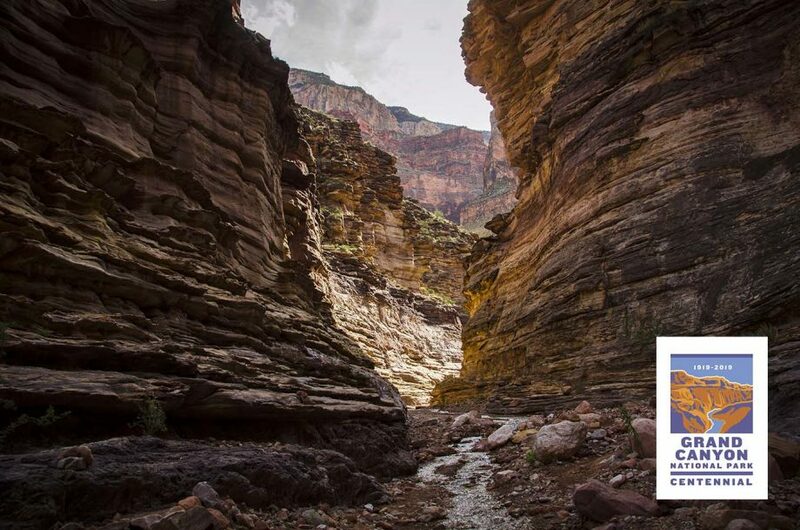 The Hermit Trail’s combined challenges make it one of the most interesting and little-used trails in the park, the perfect situation for the intrepid backpacker looking for a truly unique experience in the Grand Canyon wilderness. 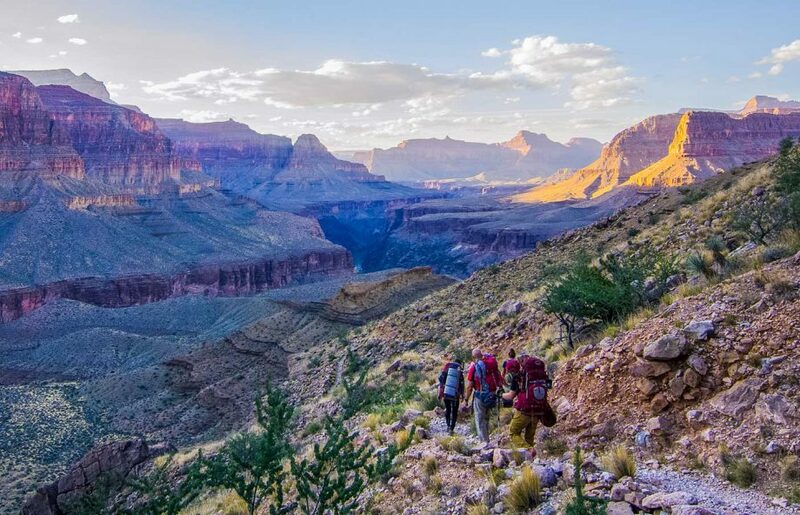 This Grand Canyon backpacking trip is an adventure to a wilderness haven without electricity, running water, or other amenities we have become accustomed to in our daily lives, and it is designed for hikers with substantial backcountry experience. Your guides meet you at 6am at the Holiday Inn Express in Old town Scottsdale and transfer to the Grand Canyon. The trailhead to the evening’s camp is a challenging yet rewarding hike – who said a Grand Canyon vacation would be easy? The first leg of the descent passes through pinyon-juniper woodlands that drop off into lower shrub-brush as you traverse the slopes of the Toroweap formation. Look for fossilized reptile tracks in slabs of rock along the trailside, they are more apparent here than on any other trail. The route steepens and turns to switchbacks as it cuts through layers of canyon wall. Take care on rocky ledges where rockslides partially obstruct your path. We’ll rest for lunch at Santa Maria Spring rest house in the shade of canyon wild grape and take a few moments to enjoy the views. The next leg of the trail descends quickly, following the rough and complex rock layers in a series of switchbacks and steep traverses. The challenge of the trail lends a deeper appreciation of the geological intricacies of the rugged realm you have entered. 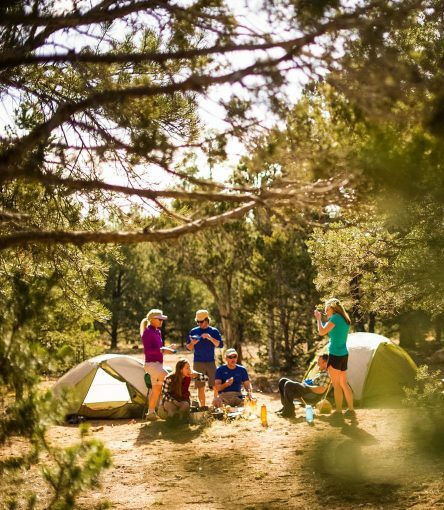 The elusively beautiful terrain and sweeping unparalleled views have inspired whimsical names like “Breezy Point,” and “Cathedral Stairs.” You will reach our campsite by late afternoon and rest while soaking in the grandeur around you. Breakfast on your own, lunch and dinner provided. After yesterday’s long hike in, today is the perfect chance to explore while unencumbered by your pack. The path from camp to the river is at first a quick and well-worn descent and then begins to blend into the terrain as you follow the canyon downstream. Further down the canyon, the walls begin to expose the sparkling black rock that is known as the Vishnu schist. The rock here is nearly 1.7 billion years old. Here the creek gives life to grasses and flowers, creating a different sort of micro-environment than those we’ve passed through thus far. Keep your eyes peeled for birds and other wildlife, as these tributary canyons are home to a wide variety of creatures including the impressive California Condor. The creek opens up to the Colorado River just upstream from Hermit Rapids on a boulder-studded sandy beach; the perfect place to lounge in the afternoon sun and watch for river runners on Grand Canyon rafting trips as they float by. 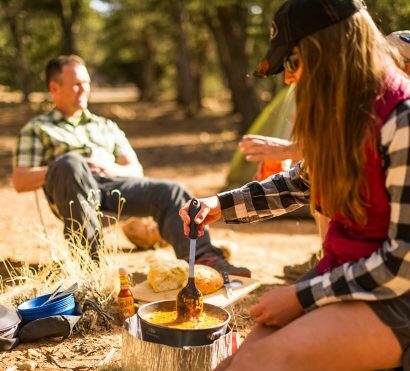 By the time we return to camp we’ll be ready for a relaxing evening with delicious food prepared for you by your guide. Lie beneath the stars and listen for the roar of Hermit Rapids on the river below as you rest up for tomorrow’s return ascent to the rim. Break camp early to take advantage of the cool morning air on the long hike out. Ascending to the South Rim caps every Grand Canyon experience with a new and unique perspective. Hiking out is always more difficult than hiking in, but as you wind up the trail you will notice features you missed as you passed quickly down. As you look out into the void before you, each sweeping view is colored subtly by your experiences over the last two days. We will take our time as we make our way up over nearly 3000 vertical feet of elevation, resting as needed. Back at the rim we’ll break for a short while before beginning the drive back to Scottsdale. Allow your accomplishment to sink in. You’ve conquered the Grand Canyon, no easy feat and one very few people can claim to have achieved in their lifetime. A good night’s sleep tonight will be well deserved as your Grand Canyon vacation comes to a close.